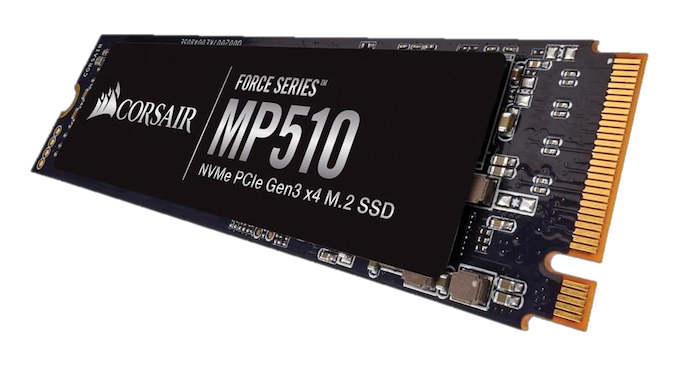 The Corsair Force MP510 is available in capacities from 240GB to 960GB, with a 1920GB model on the way. That largest model has slightly reduced performance specifications from the 960GB that we have tested, and the smallest 240GB model has significantly constrained performance, with only the sequential read speeds still in high-end NVMe territory. All capacities have a rated write endurance of around 0.9-1.0 drive writes per day and a five year warranty period, which are standard for high-end consumer SSDs. Maximum power draw ranges from 6.1-7.1W depending on capacity, so the drive will get warm but thermal throttling shouldn't be a problem outside of synthetic benchmarks. Also included in this review are several entry-level NVMe drives, our results from testing an engineering sample of the upcoming Silicon Motion SM2262EN controller, and the Toshiba XG6 OEM SSD that will hopefully get a retail version soon. If a 4TB drive becomes somewhat more affordable, then yes, they can. I guess it depends on how big of a server array you have. Personally, I have about 30TB in a 2U server using 4x4tb ZFS + 4x3tb ZFS for 20TB effective. Even a bargain basement setup for a similar size using the cheapest Micron 1100's 2TB SSDs you could find - you'd need 11 of them @ $280 each. I'm definitely waiting for larger SSDs to come down. I think if we ever get to $100/TB, I'll start to swap out more drives. 2TB for $199 would be great.